::Surroundings:: magazine: Behind the Cover Shoot of our new issue! 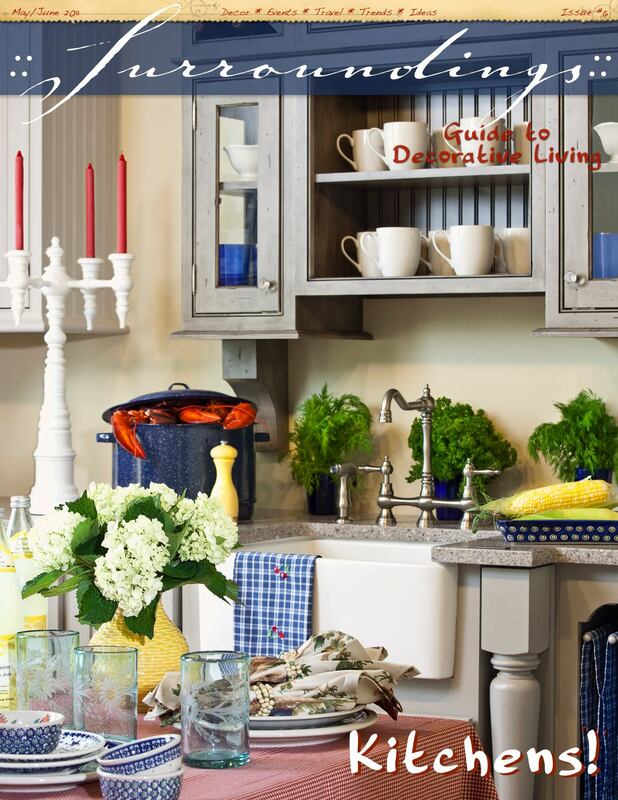 I’ve just published my latest issue of my digital magazine ::Surrounings:: Guide to Decorative Living and wanted to share the back story of the cover photo, styled by me and shot by Michael J. Lee. As we did with the last issue, the cover shot was done in a design showroom. 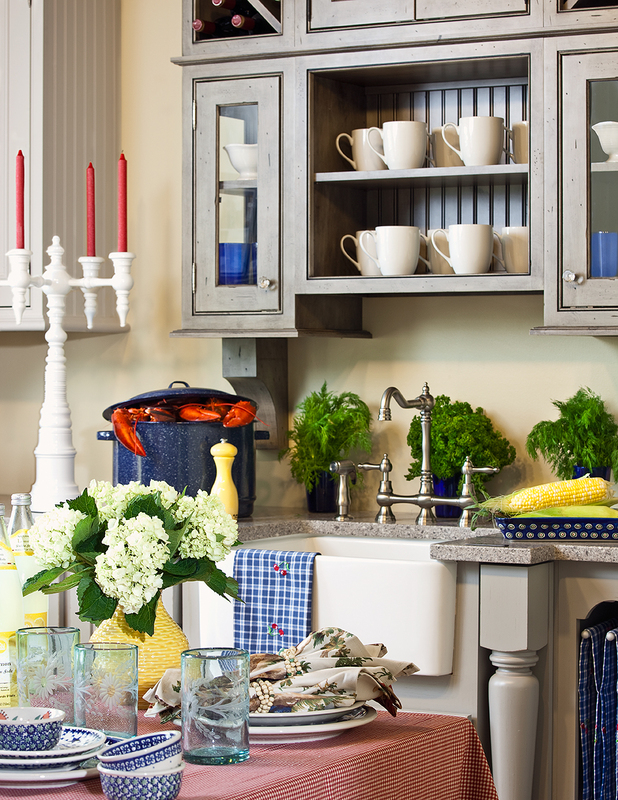 This time, we took over The Cabinetry Kitchen and Bath Studio which is located in Hingham, MA. I took some scouting shots to start the planning process of figuring out which of their beautiful kitchen set ups would work as the backdrop of the cover shot. I sent the pics to Michael as well. I was leaning towards the white kitchen wall below because it seemed so classic. From the images I sent him, Michael liked this one for the cross windows and vent-hood and that it was a stove set up, plus we thought we could use the butcher block island as a table for the foreground. My personal favorite was this sink and bead board cabinet set up. I liked that it had natural light coming from windows on the left, but was concerned that the gray paint would be too dull for a spring photograph. Never underestimate the power of Michael and his camera to make magic! Here’s a shot of the big room in the design studio with all our stuff piled about. Luckily, The Cabinetry was closed on Monday (yes, we shot the cover only four days ago!) so we had it completely to ourselves. My “story” for the shot was an indoor lobster bake with a table set up in the foreground and the kitchen in soft-focus in the background. Since I didn’t design the kitchen, I wanted to focus more on the styling with the kitchen itself as a backdrop. I borrowed a some pieces of blue patterned Portuguese pottery from a friend who has a large collection and I had the red/white mini-check table cloth and toile napkins. So, the red and blue color palette was set. We borrowed the Dunes and Duchess 4-arm Chandelier which I thought would add a unique touch to the look. I didn’t want things to be too “July 4th” since this is the May/June issue, so we skewed the accessories towards a more vintage look. So, when Michael and I got to the showroom on Monday morning, many bags and boiled lobsters in hand, we hadn’t actually finalized our shot selection. Ultimately, we did decide to go with the Medallion Cabinet set up which required us to squeeze a very, very heavy table into the room. The problem was that the room simply wasn’t big enough to accommodate the table set up and the camera. Of course, as the designer, I look at the photographer and said “well, that’s your dilemma”. As you’ll see below, Michael set up the camera outside the room, in a hallway, effectively shooting through two doorways. Another issue was that the side cabinets were not the same color as the central cabinets, which looks fine in a showroom setting, but wouldn’t have worked as well in a tight shot. Plus, the Dunes & Duchess candelabra wouldn’t stand out the way we wanted it to. So, with the power of photoshop, Michael was able to “paint” the left hand cabinet to match the lower cabinets. Thanks again to Michael Lee for his beautiful photography and to Marlene Ketchen at The Cabinetry! Also, check out Michael’s blog for his take on the photoshoot! If you would like my help on your design project, I would love to chat with you! Please email me. Thanks!